Excavations at the High Pasture Cave site during 2006 continue to reveal a wide range of new and exciting finds. The excavation of Trench 6 in Bone Passage in particular, has produced the major part of the assemblage that also includes a wide range of ecofacts including animal bone, shellfish, fish bone, charcoal, burnt plant remains and land snails; and the more usual types of artefact including fire-cracked stone and coarse pebble tools. However, the digital images that follow include some of the more unusual and interesting items recovered from the site during 2006, many of which have been found in Bone Passage, where the man-made stairwell meets the natural cave. This location, a liminal place demarcating the Overworld from the Underworld, must have formed a special place for the prehistoric inhabitants of the area who visited the site. 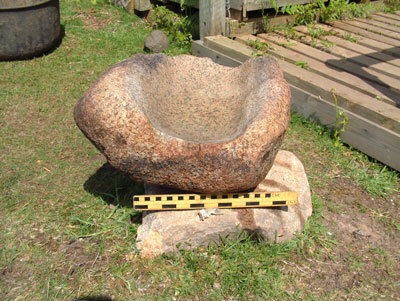 The fine granite saddle quern recovered from the base of the stairwell in Bone Passage (Scale = 0.25m). The quern had been placed upside down in the passage and displays a significant amount of wear. 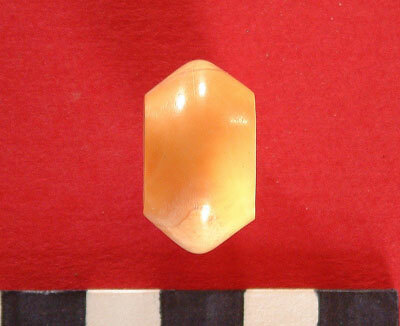 A limestone pendant from the base of the stairwell (Scale = 5cm). The hole through the pendant is most likely natural, but wear around the hole indicates that some form of thread has been passed through it. A similar limestone item was recovered from Bone Passage in 2005 and when examined in more detail was found to contain the fossil of a sea urchin. 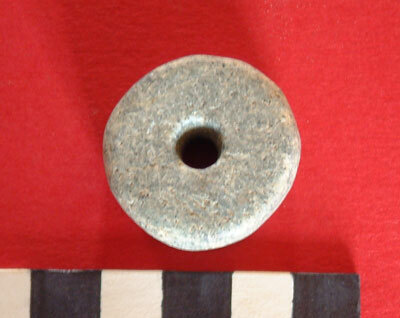 This beautifully made soapstone spindle whorl or pendant was also recovered from the base of the stairwell (Scale = 5cm). The item shows little evidence of use and is one of several items manufactured from soapstone recovered from Bone Passage, while a flake of the worked material was also recovered from the same context. 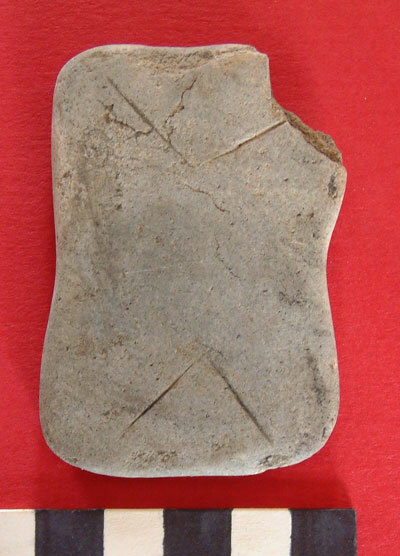 Decorated stone palette from the base of the stairwell in Bone Passage (Scale = 5cm). 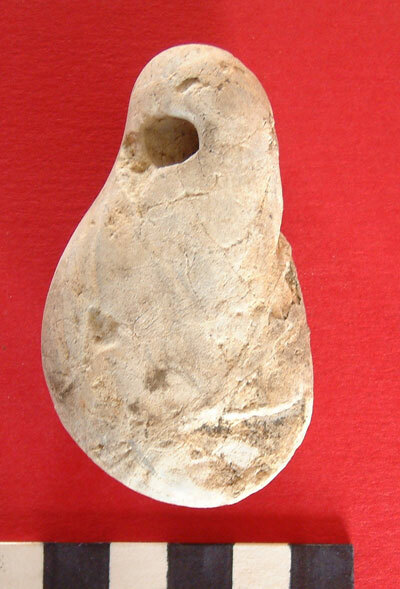 Flint thumbnail scraper recovered from context C605, Bone Passage (Scale = 5cm). This type of scraper is normally associated with the Bronze Age and is most likely manufactured from a flint pebble collected from the coast. The thumbnail scraper and a range of flint flakes recovered from Trench 6 (Bone Passage) and Trench 7 (roundhouse trench). 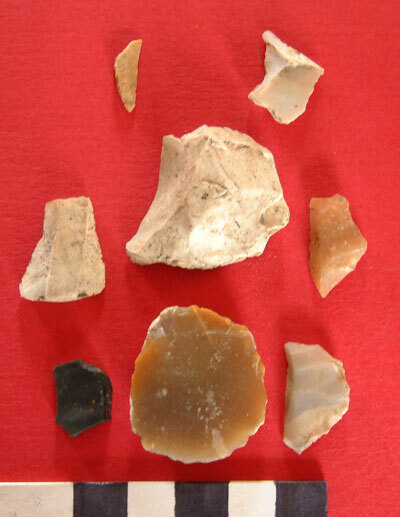 Materials include flint and Rum Bloodstone, while the item at top left is a flint microlith of possible Mesolithic age (Scale = 5cm). 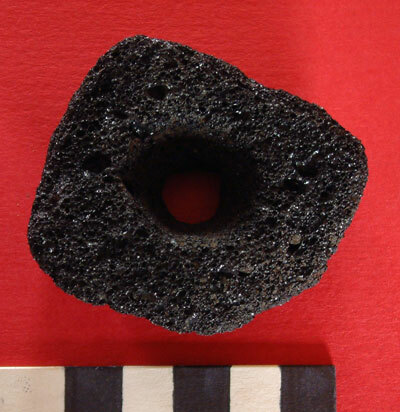 This large piece of worked pumice was also recovered from context C605 in Bone Passage (Scale = 5cm). The pumice has a hole bored through it, after which some form of process has resulted in a funnel-shaped aperture in one side of the item. 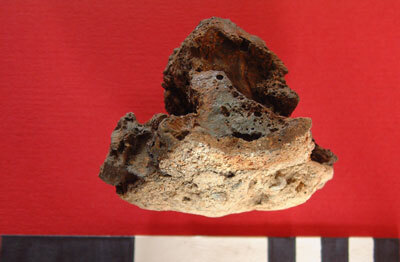 Several pieces of iron slag have been recovered from Trenches 6, 7 and 9. The piece above, which may be the remains of a furnace base, was recovered from the burnt mound material in Trench 9 (Scale = 15cm). 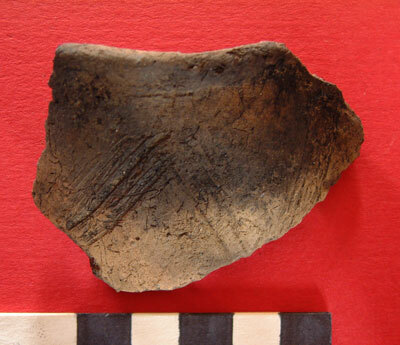 This rim sherd has quite a thick wall section and appears to be from a vase-type of pot. 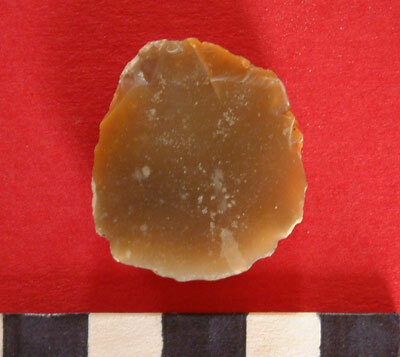 The sherd has a combed finish to the outside (Scale = 5cm). 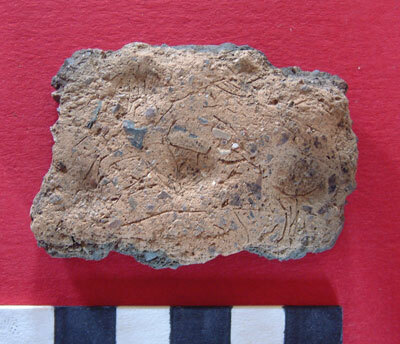 This image shows a decorated basal sherd, the decoration being on the inside of the pot and formed with finger impressions - where it would be difficult to see (Scale = 5cm). 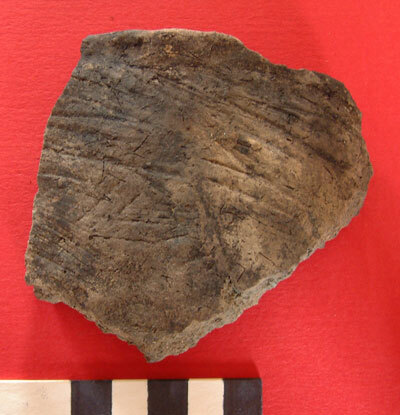 This rim sherd has the characteristic chevron decoration that is quite common in Iron Age pottery assemblages from the Western Isles (Scale = 5cm). 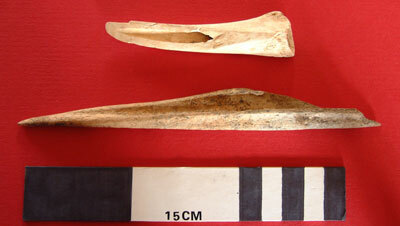 These items of worked bone, which includes the fine point at bottom, were recovered from the base of the stairwell in Bone Passage (Scale = 15cm). 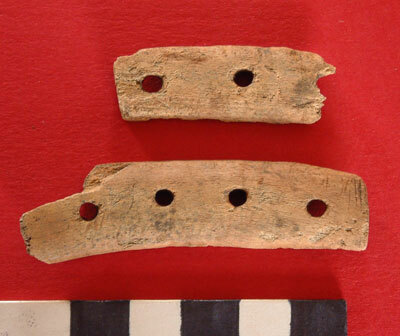 Antler perforated plates recovered from the base of the stairwell (Scale = 5cm). We have found a total of 7 fragments of these plates from Bone Passage, some of which have the remains of bone or antler pins within the perforations. 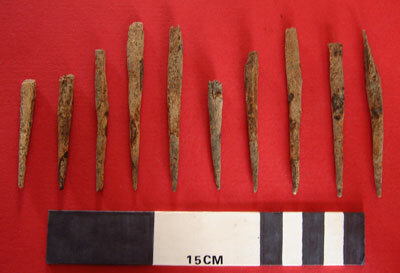 This cache of antler/bone pins was recovered from the top of a step or paving slab in context C605, at the base of the stairwell, Bone Passage (Scale = 15cm). The pins display cut and tooling marks from manufacture, some of which extend well down their length toward the point. And, although slightly degraded, it appears that the pins have seen little use before deposition in the cave. 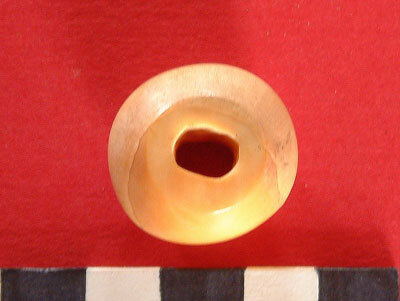 This highly-polished bone or ivory bead was also recovered from context C605, within Bone Passage. Tooling marks are visible on the cheeks of the bead and within the elogated hole that has been worked through it (Scale = 5cm). The image below shows a side view of the same item. The image above shows the remains of a fragmented copper-alloy pin recovered from Bone Passage and copper-alloy fragments recovered from a context rich in charcoal and calcined bone in Trench 2. Below these are 4 glass beads - 2 of a translucent blue, 1 of red and 1 of orange/red - all recovered from the base of the stairwell in Bone Passage. 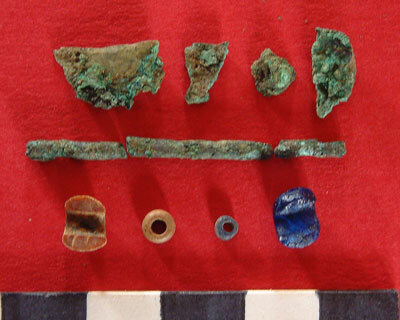 All of these items were recovered from the wet-sieving residues (Scale = 5cm).